Can't beat this price on one or two pocket full length bistro aprons. These aprons are made overseas, hence the lower price. Remember, there is a 12 apron minimum for this sale item. 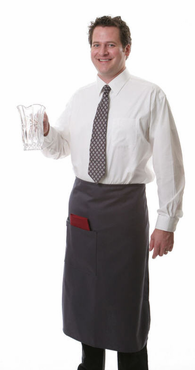 Making sure you have quality waitress and waiter aprons is a breeze when you shop online at Sharper Uniforms. We carry great waist aprons, including this bistro restaurant apron. This selection is available in either white or black. Furthermore, you can choose one or two patch pocket selections. Whether you are running a greasy spoon or a five-star bistro, these aprons are perfect for your needs. Regular price is $8.95/2 pocket - $7.90/1 pocket per apron! Can't beat the price, it's great!